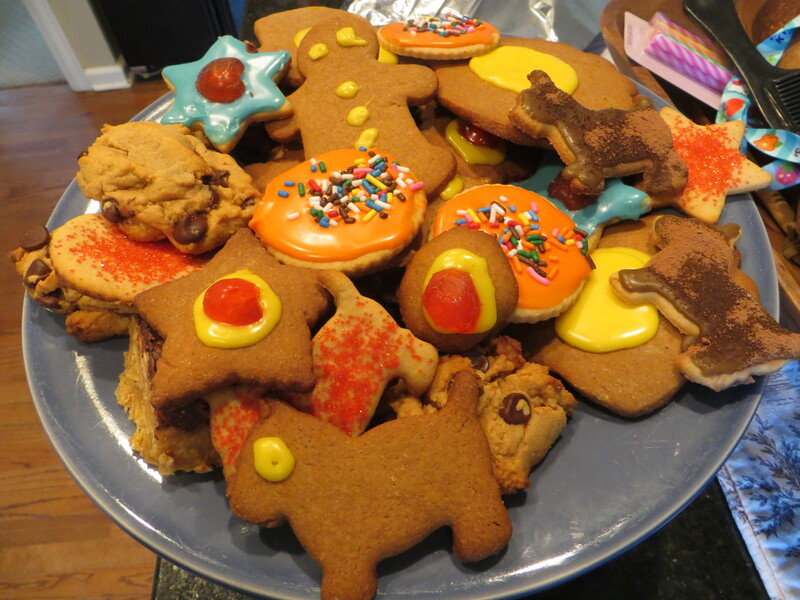 Some Christmas cookies are staples — in the Webner household, it just wouldn’t be the holidays without iced cutout cookies — but I always like trying a few new cookies and adding them to the mix. I found this recipe for this delicate concoction in the helpful King Arthur Flour Cookie Companion, and they look fun to make. Any cookie that you bake by flipping over a baking sheet and using the bottom is worth trying at least once. Preheat oven to 425 degrees. Flip over your baking sheet and lightly grease the bottom, so the rim of the cookie sheet won’t interfere with lifting the cookies after they are baked. Cream together butter and confectioners’ sugar. Add the honey and mix until smooth. Add the ginger and half the flour and stir. Whisk the egg whites briefly, then add half of the egg whites to the mixture. Add the remaining flour and stir, then add the rest of the egg whites and mix until a smooth batter forms. 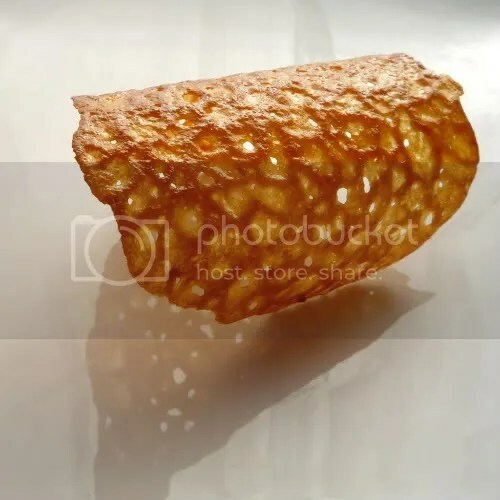 Drop the batter by teaspoonful on the back of the cookie sheet, then use the back of a wet spoon to spread the batter to circles about three inches in diameter, so thin you can almost see through it. Bake for 4-6 minutes until cookies are golden brown. Remove the cookies from the oven and let them sit on the baking sheet for about a minute, until you can move them without the cookies wrinkling. The cookies can then be shaped or served flat. I’m going to try shaping the cookies, with a honey-nut filling or a fruit filling, to put a different shape in my holiday cookie tins. Mom has issued another call for cookies, and she’s also made it plain that — with all due respect to my interest in baking experimentation — she wants iced sugar cookies, thank you very much. No other cookies need apply! So, with my recipes strictly limited, I have to let my creative juices flow with the icing and toppings. This is why confectioner’s sugar, food coloring, and colored decorator’s sugar were invented. Mom asked for a new batch of cookies — just in time for Mother’s Day — and what dutiful son can refuse his mother? 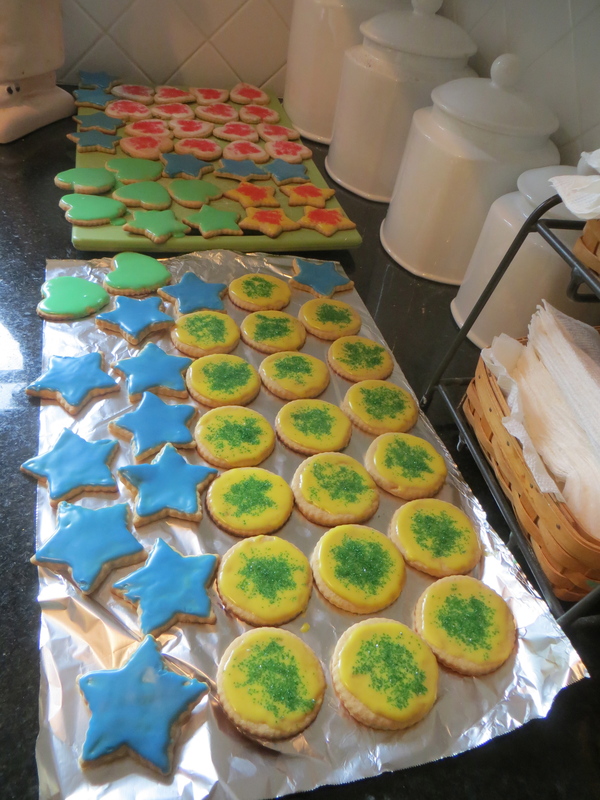 She had a hankering for some iced sugar cookies, and I tried to choose icing colors that looked like spring, with pastel blues, greens, and pinks. Of course, some chocolate-flavored icing made with Nestle’s Quik and some sprinkles can’t hurt, either. 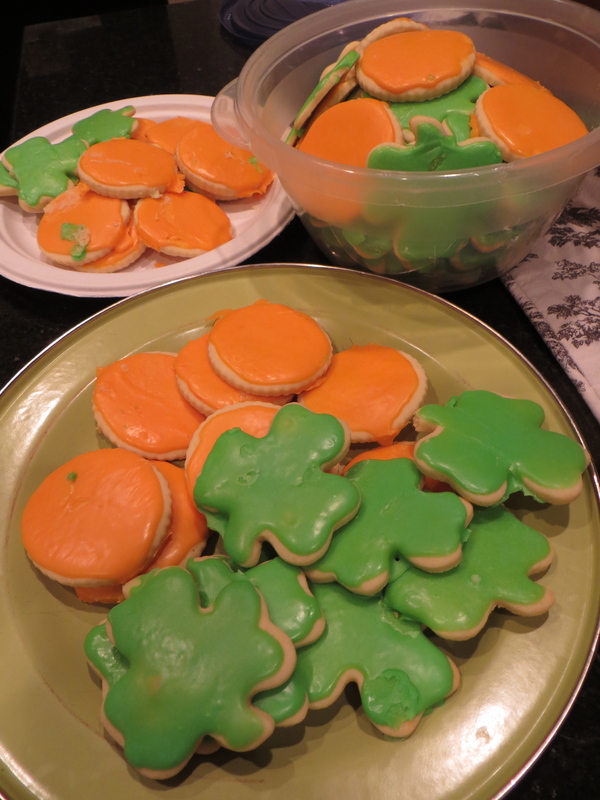 After some serious baking and pathetic attempts at decoration, I’m ready to bring my cookies over to Mom. What’s a spring cookie? Got me! 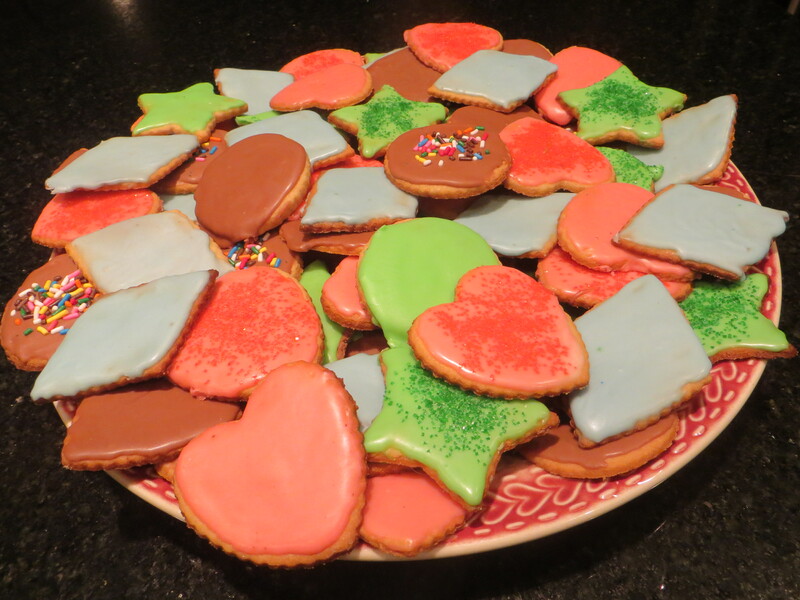 I tried to make do with gingerbread men and gingerbread baseball mitts catching icing balls, Scottish terrier sugar cookies dusted with chocolate, bright orange and blue cutouts topped with candied cherries and rainbow-colored decors, and some peanut butter and chocolate cookies. Oh, and I added some of those chewy Fritos corn chip and peanut butter bar cookies that my sister Cathy specifically requested. I’ve made a plate full and a filled storage container, besides. Now it’s time to deliver the goodies. Mom asked me to bake some more cookies that she could share with her guests, so yesterday was a baking day. 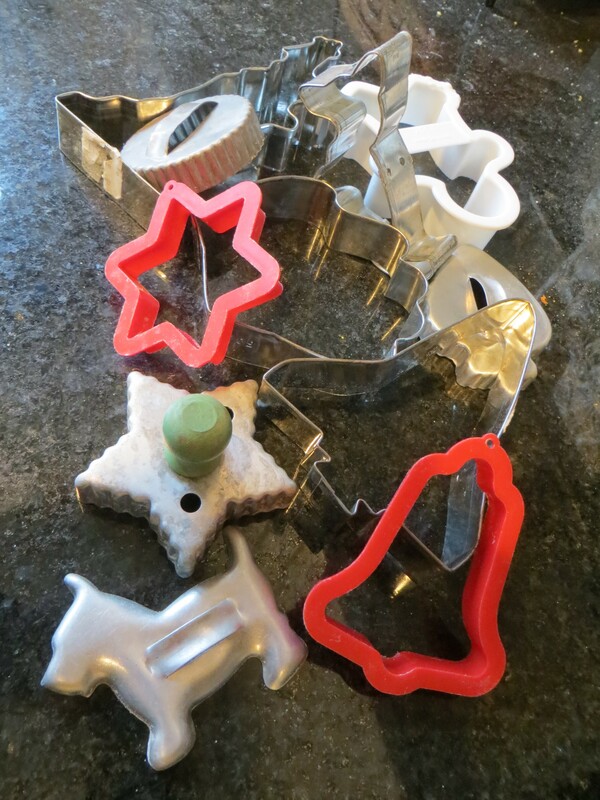 As I was figuring out a good assortment, I also had to consult our collection of cookie cutters to decide which cutouts to use. Many of our cookie cutters have a distinctive Christmas orientation, but over the years we’ve inherited and acquired an eclectic collection — a grab bag of dogs, hearts, a gingerbread man, stars, a baseball mitt, and even the Statue of Liberty and the space shuttle. They are variously made of tin, sturdy plastic, and a thin, highly bendable metal; some have handles and others don’t. Predictably, I like the older, metal cutters that probably date back at least 50 years. My favorite is the little Scottish terrier cut-out. It requires a little care and patience to extricate the cookie; you need to gently put a butter knife through the handle and nudge the cookie dough out. It’s worth it. I’m confident that anyone who picks up a cookie in the shape of a little dog will have a smile on their face.